That sounds very threatening IMO, and you are cherry-picking and exegerating what's been posted here. Let me remind you that in this thread people have dug up and found a tremendous amount of inconsistencies and exegerations in most of his athletic claims. His 10k PB for one was proven to be bogus and you know it. I don't know what to tell you brother, but you're mistaken if you think a running forum is going to simply disappear because people are asking serious questions and now have enough reason to believe he's a cheater. If anything his sponsors should be scrutinizing their athlete's achievements and pushing him to put up supporting data. If Rob is doing this honestly then he should have nothing to worry about. I am being concerned by the legitimacy of this attempt purely by the total absence of presented evidence in the first place. I would be the first to follow and support a project like this, especially if I could see where he was running, what his pace was, cadence, maybe even HR. In short, just like i follow many runners on Strava. By seeing their data, you can get a feel for what they have done on that particular run. I think this goes for most of the people here. You really don't think a major international company wouldn't sue a website they felt contained erroneous posts that unjustly damaged their brand? They wouldn't even have to sue, the threat to would close letsrundown faster than a 100m World Record. A major international company basically just sued a runner for wearing a new balance top. Here are 70 pages of a site calling one of Lucozade's sponsored athletes a liar and a cheat. If they backed Rob over this site and wanted to defend him/their brand they'd threaten legal action and the site would have no choice but to erase all mention of the thread. Thats the beauty of the American Justice System, if you have money you basically call the shots. I'm sure they will cut off any sponsorship immediately after starting to background check this guy. Get him where it hurts, the wallet. Can I get a list of all of Robert Young's sponsors. I need to make some phone calls to get them to come read this thread so they can cut off all the money. Look up "Streisand Effect", their lawyers will know all about it, even if you don't. You are doing God's work! Great job. I have to say the most frustrating part of all this is that he is an accomplished runner. I believe that he does have the talent/desire/determination to complete ultras. He isn't the best the world has ever seen, and so I don't think that he could break the record, but the complete lack of preparation and planning makes me wonder if he planned to dupe this the entire way. His website has him as part of the Skins running team, and you can see his running plans for the next year (races are in there), he even has a relay planned with a very accomplished runner (the other Skins athlete). He must know how hard people train, and for him to inflate 40 mile days to 70 is frustrating. He might be capable of 70 mile days, but not when he is doing 25+ miles at sub 7 pacing with terrains going straight up (if my interpretation of his logs is correct). Ever heard of Kip and Mike Rossi? They were also "honest" and I'm afraid LRC is still standing. There is zero grounds for a lawsuit. Under your logic, Nike would have shut down LRC ages ago. 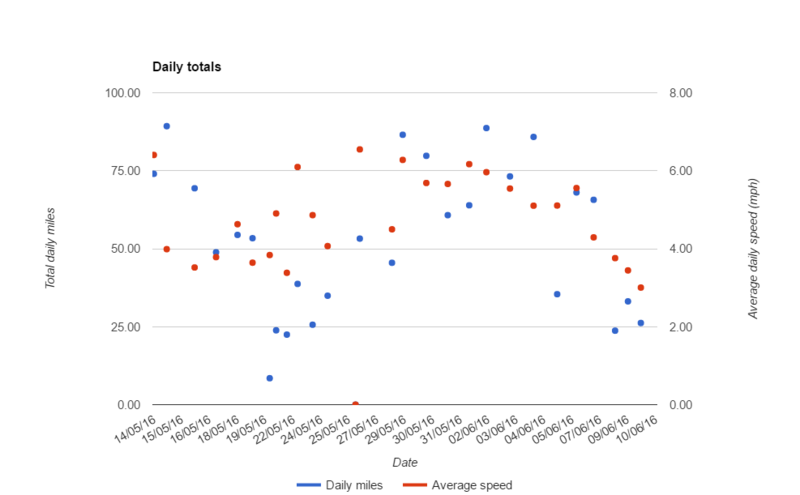 I made this sheet with total daily mileage and average speeds. Not sure if the original data is yours or the other guy's. That's a great question!! I'll contact them and present the evidence and see what they have to say. I need not forget the articles written by Outside Online and Deadspin so they can get sued as well. Speaking of questions, why won't they upload the watch data? Listen, Johnnie Cochran. So far Rob Young has not shown the highest degree of transparency in his World Record Breaking Endeavour. Maybe you haven't followed the jurisdiction of the Armstrong-case. Wish I would of thought of that. Zing!!!!! Did this guy ever held a real job after leaving Royal Army as their "elite -athlon" officer? It is a great way to make a living. Get subsidized to run only with hobbyjogger credentials. RE: Robert Young fakes run across America 6/11/2016 2:23PM - in reply to Weird stalkers.. I'm still in serious data malnutrition. Wait until it shows up on Strava! "I was slow: Mr Plod, Dr Dawdle." Didn't he set his 30.47 10k pb when he was a triathlete? Tell me any triathlete who would describe themselves as 'Mr Dawdle' with these credentials. Oh no! I forgot, he's SO modest. He must have been one hell of a cyclist. Oh no! I forgot. He was a mediocre cyclist. The Scot. Great job. I think Rob and his handlers just peed in their undies a little. The scrutiny will only get greater from here. I am just waiting for the Marathon Investigation to also get involved.